Anyhow, I gave it a shot right when the blog post first came out, and was frustrated at my lack of success. The setup is fairly simple, all you have to do is copy and paste the script into the script editor (which I didn’t even know existed up until now). 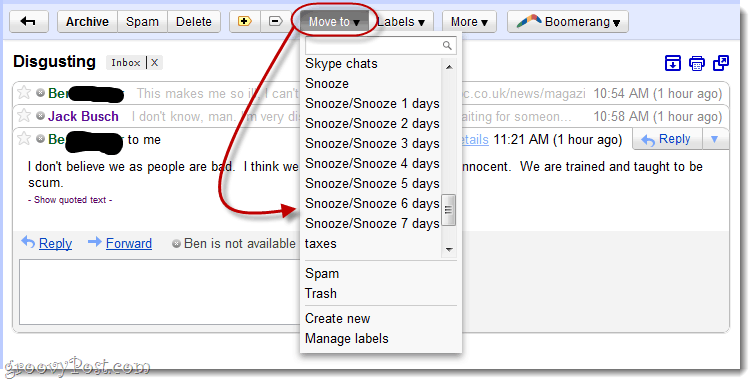 It’s all laid out in the Gmail Blog post. However, when I followed the steps, I kept on getting automated emails with the subject “Summary of failures” (fun fact: also the name of my forthcoming memoirs) that said: “TypeError: Cannot call method "getThreads" of null. (line 28).” Also, when I ran setup, I didn’t get the labels made, as per the video showed. Today, I tried it again, but this time, I made sure to save the Google spreadsheet before creating the script. And that made all the difference. So, what you have to do is exactly what it says in the Gmail Blog post, but before you do it, create a new Google spreadsheet in Google Docs, give it a name and save it. Now everything works fine. The reason I didn’t troubleshoot this earlier is because, fed up with the script, I decided to try out an easy alternative: Boomerang. Boomerang is a Google Chrome extension which does essentially the same thing as Gmail Snooze, but it’s a little bit more user-friendly. You can get Boomerang from the Google Chrome Web Store. Overall, I like Boomerang, but I’m not crazy about how it un-snoozes things (it adds some mumbo jumbo to the thread) and it’s also not free. You do get a free trial for 30 days. Just a taste to get you hooked. Thereafter, it’s $4.99 a month. There is a free version that limits you to 10 message actions, but that’s not really going to get you far. 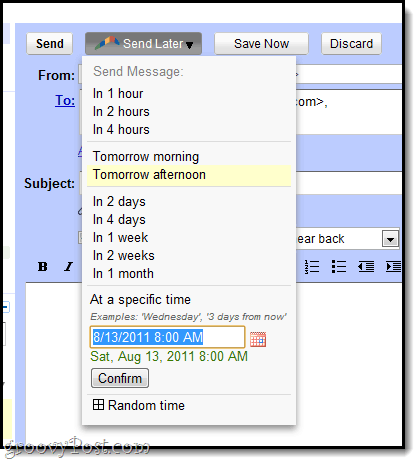 The schedule emails feature is quite nice, and if you are a Gmail power user with $5/mo to spare, I say go for it. 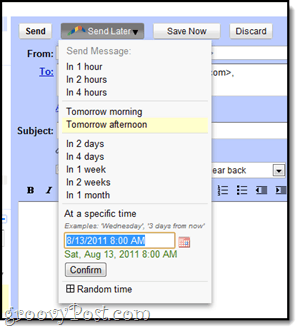 But if you’re subsisting on Ramen and not afraid to fiddle with the Apps Script Editor, try Gmail Snooze again—but this time save the spreadsheet before you create the script. As pointed out by Matt from Baydin, the developers behind Boomerang, you can easily change the behavior of Boomerang’s returned message. 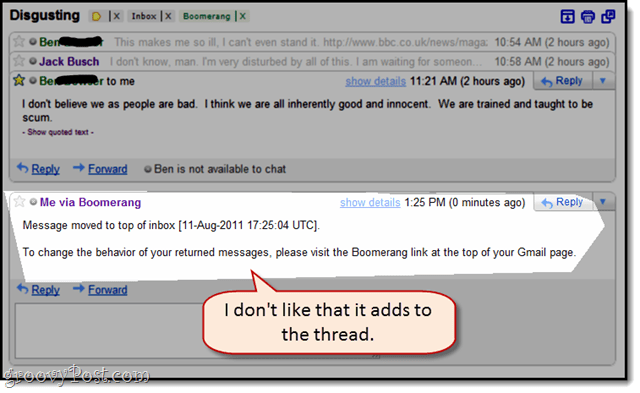 Just go to Boomerang > Manage Scheduled Messages and uncheck “At the top of your inbox.” Thanks Matt! This is Matt from Baydin, the makers of Boomerang for Gmail. Thanks for the post and the feedback about the message added to the thread. You can actually change your settings so that it doesn’t appear again. 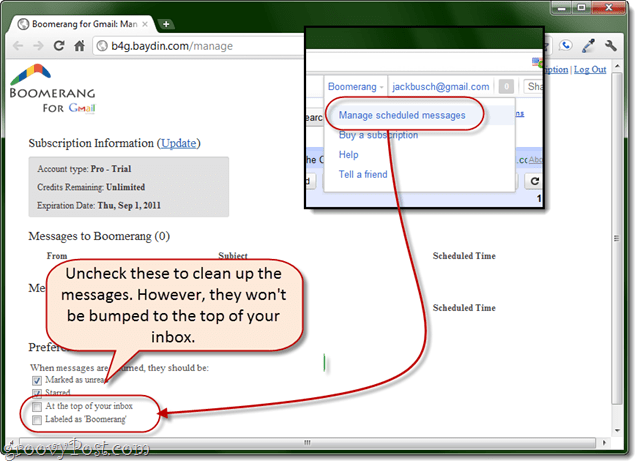 All you have to do is go to the Manage page (https://b4g.baydin.com/manage) and uncheck ‘At the top of your Inbox’ option under Preferences. We just changed the text of the additional message to make it more clear how to do this. Thanks for helping us clear that up! Wow, that post was only up for 120 minutes. Talk about fast customer service ;-) Thanks for the tip, Matt – will update the write up! As much as I like Boomerang, it doesn’t work for me. Because I’m an individual who happens to have a Google Apps account, I’m penalized by Baydin and have to pay their flat “Google Apps” fee (which is *way* too much for the service, even as convenient as it is to have). Seems like a smarter route to have taken with regards to pricing would be to price based on number of users for a Apps domain. Oh well, here’s to hoping somebody else, or Google themselves, produces a product with similar features with a better pricing model.